The OMB-DBK24 has been discontinued. Please contact our Data Acquisition Engineering department. The OMB-DBK24 is a 24-line digital-output module that provides isolated digital outputs for OMEGA’s OMB-LOGBOOK and OMB-DAQBOARD-2000 Series data acquisition systems. The OMB-DBK24 provides 500 V of channel-to-channel and 500 V of channel-to-system optical isolation for complete system protection. This isolation protects the data acquisition system from damage caused by accidental contact with high external voltages and eliminates troublesome ground loops. Up to eight OMB-DBK24 modules can be connected to one system, for a total of 192 digital outputs. 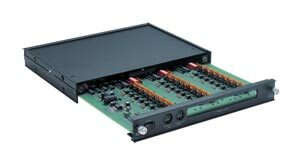 The OMB-DBK24 connects to a system’s P2 digital I/O connectors and uses the existing digital I/O lines as a communications bus. Thus, the lines on a system’s digital I/O connectors are not user accessible when an OMB-DBK24 is in use. The OMB-DBK24 can be daisy-chained with other OMB-DBK digital I/O cards or modules via optional expansion cables. Signal connections to the OMB-DBK24 are made via screw terminals, which are conveniently located on its slide-out PC board. The module features a power-on-reset function, allowing users to set the outputs to either “on” or “off” prior to start-up. Each power up output state is determined by dip-switch settings prior to the first write command to the module. The OMB-DBK24 is equipped with an internal power supply and external AC adaptor. It can also be powered from an OMB-DBK30A battery module, a 12 V car battery, or from any 9 to 24 Vdc source.